Ava would like nothing more than to tell her family she loves them, particularly her big sister, Nic. But Ava has Rett syndrome - she can’t talk, can’t nod her head, can’t even point at a communication card. She understands everything, but no one understands her. When tragedy strikes her family, Ava becomes even more determined to talk. But it’s not until she meets occupational therapist Kieran and new friend Aimee that she is hopeful for change - and to find her voice at last. Queensland author Samantha Wheeler is already a Readings’ favourite, with two of her middle grade novels previously shortlisted for The Readings Children’s Book Prize. Her latest is an incredible piece of writing that feels very personal and intimate. 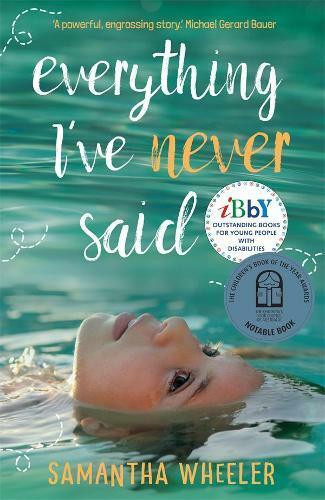 Written from the perspective of eleven-year-old Ava, who has Rett syndrome, it is a beautiful, empathetic story that may have you in tears. Rett syndrome is a rare neurological disorder found in females which renders a young child unable to walk, move without help, or speak. Ava is fully functioning on the inside, yet frustrated that she is forced to watch TV shows that are for young children, she is dressed in clothes she doesn’t like, and she can’t physically articulate for herself apart from the ability to scream, which she does when she’s scared or unhappy. Of course, this is hugely embarrassing to her big sister, Nic, and makes life tough for her parents. When tragedy strikes the family, they must work together like never before. Written with great insight and empathy for Ava’s plight, this is a story that wears its heart on its sleeve and shows the very real hardship of a family struggling with major challenges. This magnificent book will appeal to readers of Wonder by R.J. Palacio or Out of My Mind by Sharon Draper, but will also be devoured by almost anyone with a heart. Do yourself a favour and read it immediately, but bring some tissues. Suitable for age 9 to adult.